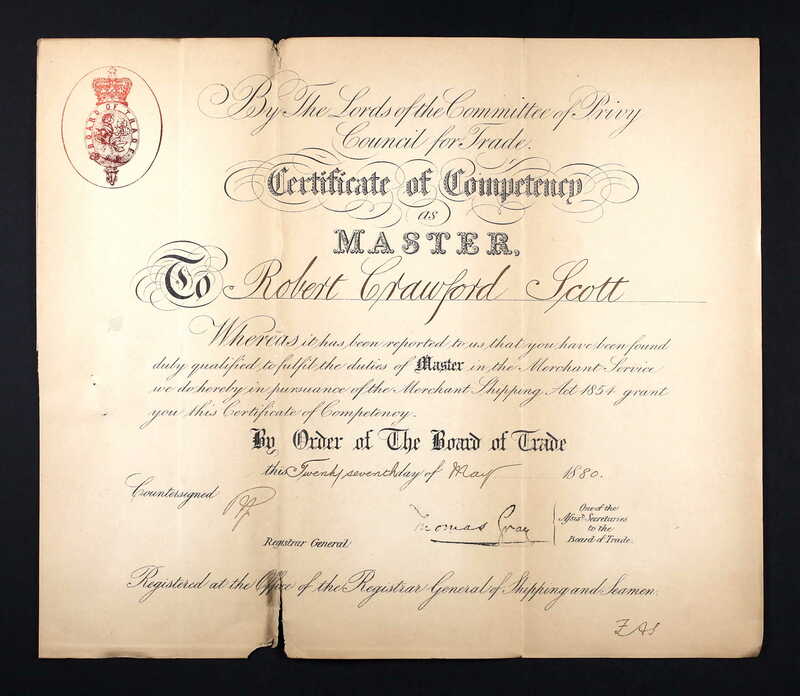 Robert Crawford Scott was born on 25 May 1852, the second son of Robert Crawford (senior) and Dorothy Piercy. His older brother George was two and a half years old at the time, his mother was 25 and his father 27. Dad was likely away at sea, serving at the time as Mate on Lydia. 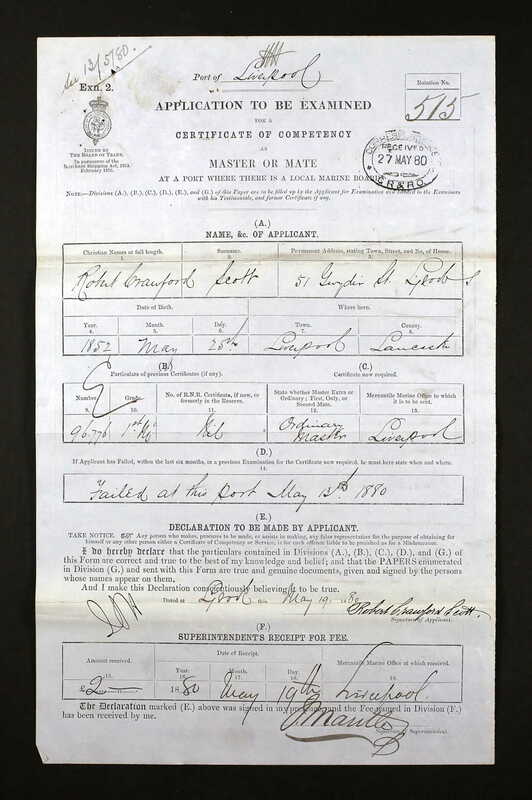 Robert would have lived with his mother at 42 Bridgewater Street, where his maternal grandmother was head of household and her occupation given as boarding house keeper. It is possible that they rented rooms out to sailors who found themselves between ships. 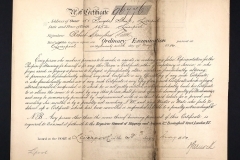 He was baptised at the nearby church of St Michael’s in Pitt Street on 27 June 1852. 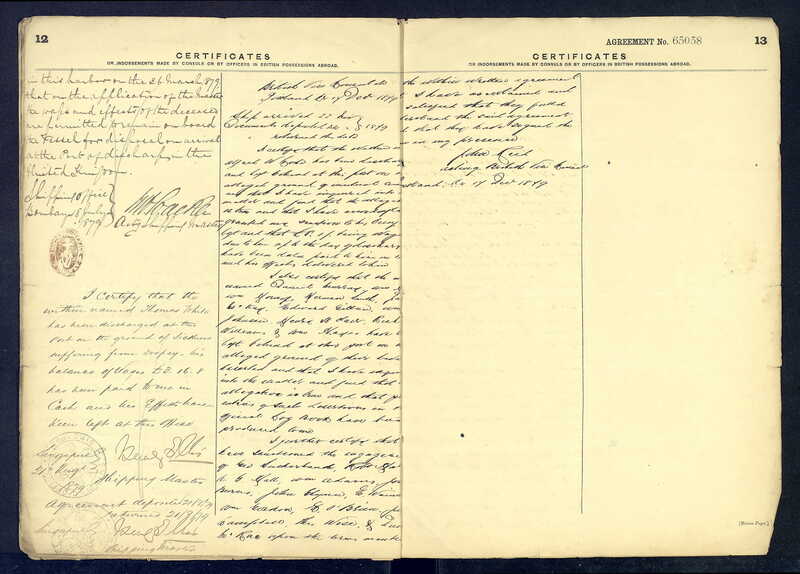 Sisters quickly followed – Agnes Mary on 22 December 1854, and Margaret on 21 June 1857, so by the time Robert was five years old there were four children at home. 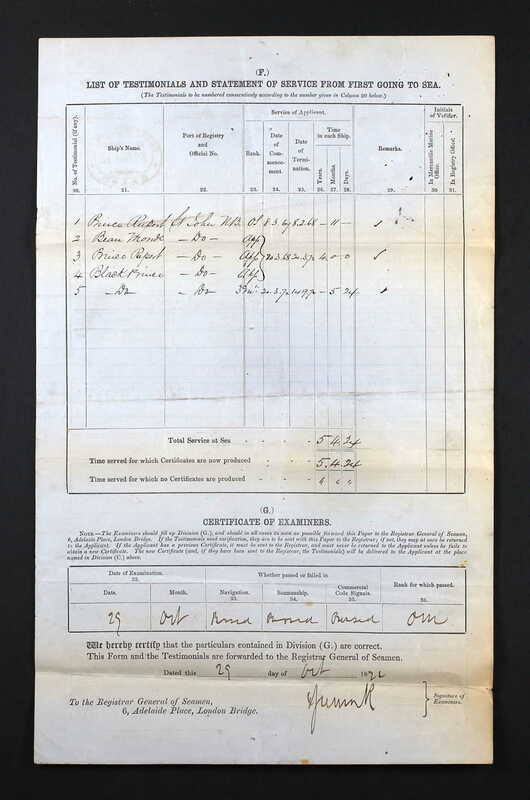 In April 1861 they were all living at 140 Bedford Street, together with his 77 year old grandmother, a visiting Master Mariner Robert Challenor(?) and boarders Jane and William Simpson (stone mason). 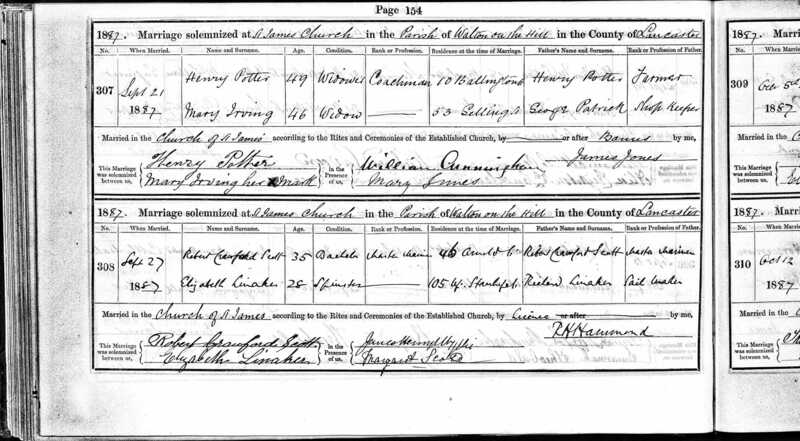 Younger brother James Harrison Scott came along in June 1862, but sadly mother Dorothy died two months after this on 26 August 1862. 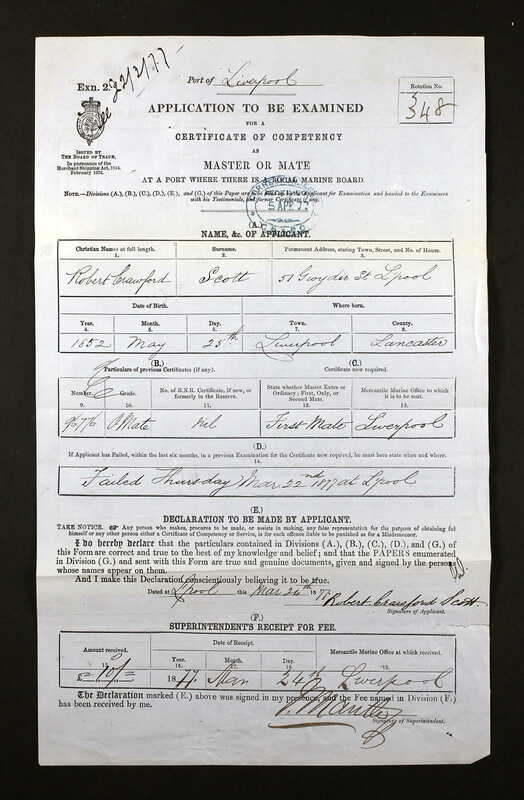 Robert went to sea aged 14 on 8 March 1867. He was an Ordinary Seaman – the lowest rank – on Prince Rupert, where his father was Master and his older brother George had worked his way up to Third Mate. He spent the first 11 months of his career on Prince Rupert – they arrived at Gravesend from New York 16 October 1867, and his final voyage from Rangoon ended at Falmouth on 3 February 1868. His apprenticeship proper began on 20 March 1868 on Beau Monde. At some point during his four year stint he moved back to Prince Rupert, and from there to Black Prince. On 12 October 1870, Robert’s younger sister Margaret died at Berwick – she was just thirteen years old. 13 March 1872 arrived at Deal from New York. 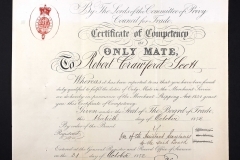 On 20 March 1872 Robert’s four years were up, but he was still aboard the Black Prince and was immediately promoted to third mate – whether this was due to ability or nepotism I cannot say. 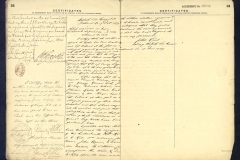 He stayed with the ship until 14 September 1872. 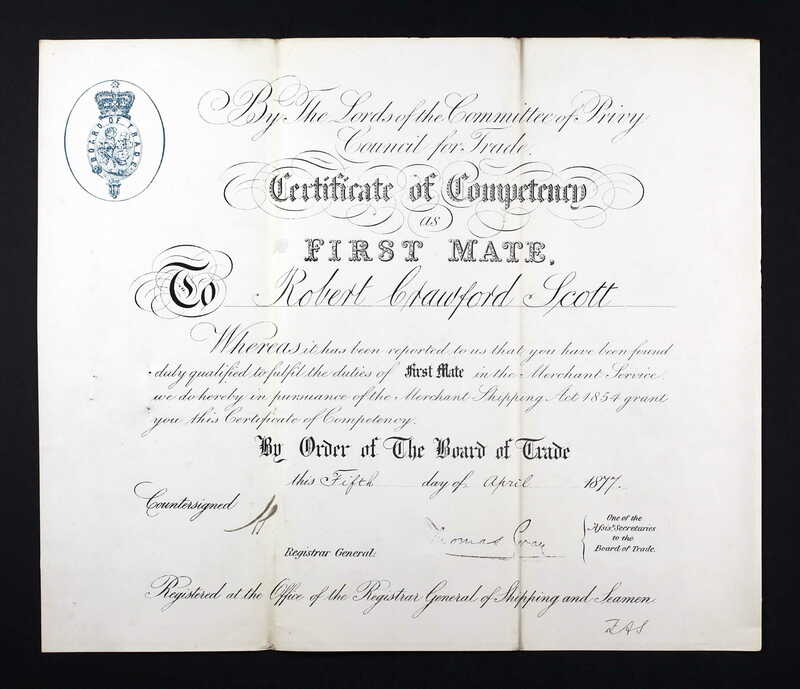 While ashore, on 29 October 1872 RCS took his first examination and gained his Only Mate’s ticket, giving his address as 11 Upper Stanhope Street. There’s a mysterious two year gap in the history here immediately after taking his Mate’s exam. He doesn’t seem to have been at sea during that time, at least no vessels are recorded on his next testimonial. 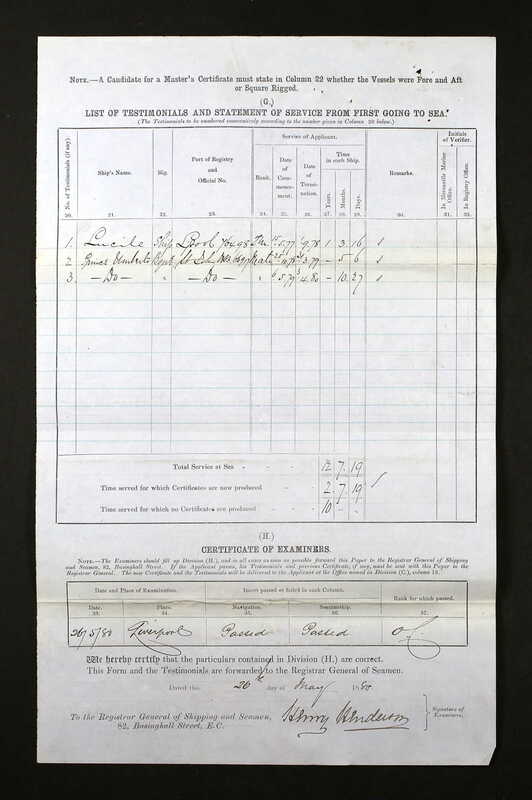 When he did go back before the mast, on Slieve Bloom on 20 January 1875, he spent 10 months and 7 days aboard her as 2Mate, followed by five months ashore, then joining Parkfield on 14 April 1876. 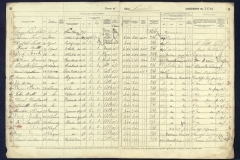 This lasted seven months, bringing us to 20 November 1876. Robert Crawford Scott was now 24 years old. 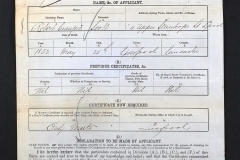 In spite of his absence from the sea, in 1877 he took his First Mate’s examination. 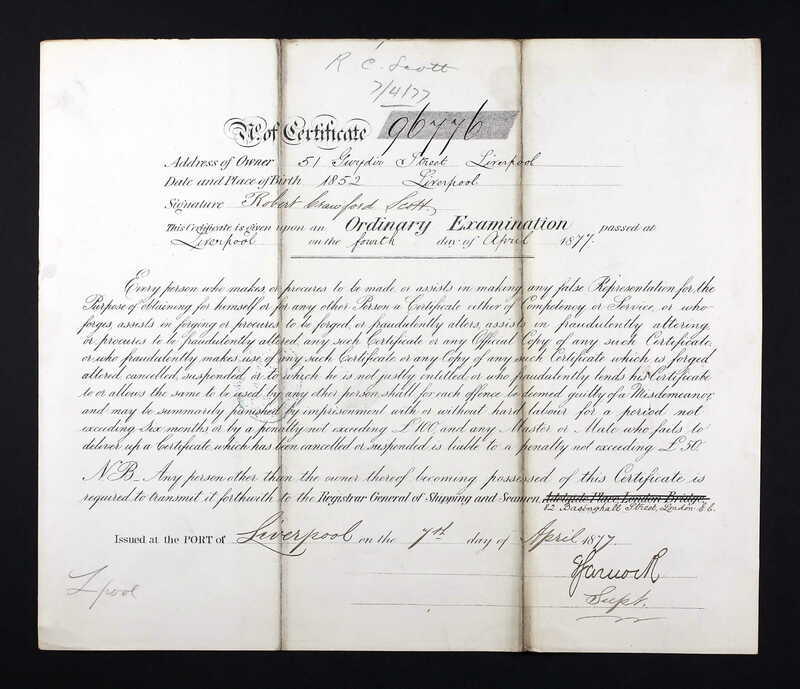 Perhaps his seamanship was a little rusty, as the record shows he failed the exam on his first attempt on 22 March 1877, but passed two days later. The fee was 10 shillings. I wonder if he had to pay twice? 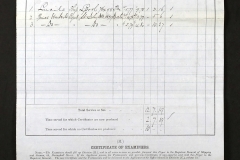 Ten bob was a lot when an ablebodied seaman might have earned £3 per month. 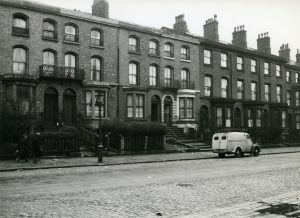 Robert’s address at this time was 51 Gwydir Street, a little further out of town than any of the family’s previous Liverpool homes, though still only two miles from the Pier Head. At this time a new type of housing was emerging in Liverpool – the ‘terraced cottage’. From the beginning of the nineteenth century the majority of homes in Liverpool had been of one of two types. There were streets filled with grand Georgian style townhouses for the prosperous, and cramped insanitary ‘court’ housing squeezed into every available space for those less fortunate. As more importance was attached to such ideas as fresh air and running water, the court houses were legislated out of existence. More land was needed so development spread rapidly outwards from the City and its docks. 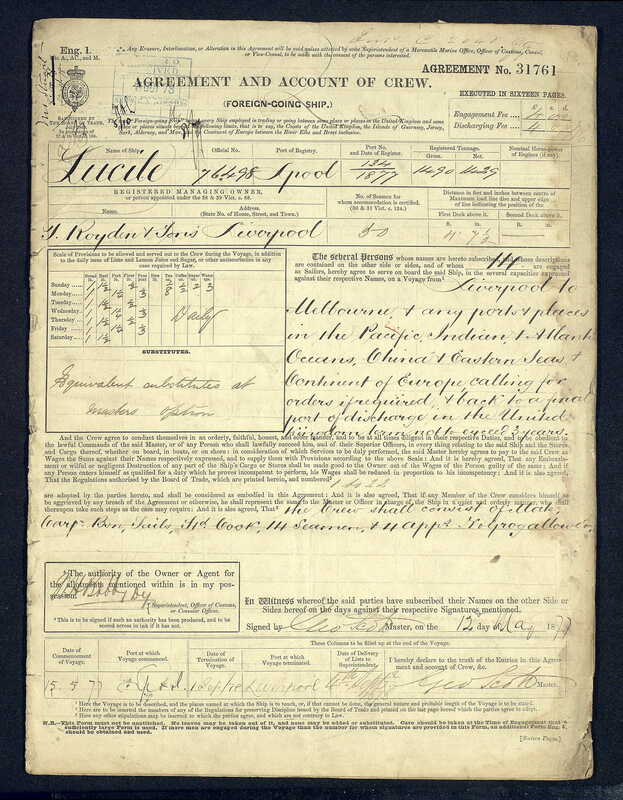 Many of the new estates were constructed by Welsh migrants to Liverpool, both entrepreneurs who saw a new market for slate, brick and timber, and labourers who came to earn their daily bread. Gwydir Street was part of this expansion. This wasn’t a room in a boarding house, a place to flop and stow his sea-chest between voyages, it was a home. Perhaps Robert’s living here signified an intention to put down roots? Further enquiries have shown that Robert was likely lodging with relatives when he gave the Gwydir Street address. 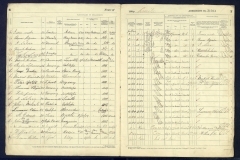 The 1881 census for that property shows it was occupied by a George Palmer, brother of Margaret Palmer who had married George Peter Scott in 1872. 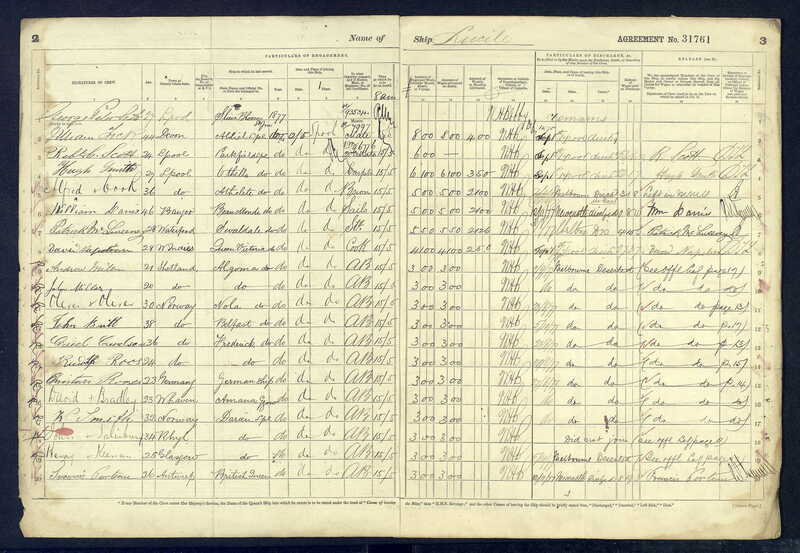 To make up the shortfall, seventeen hands were engaged at Melbourne, twelve at Newcastle, and three at San Francisco. They were a motley crew – as well as the English, Welsh, Scottish and Irish there were Norwegians, Swedes, a German, a Spaniard, several from Barbados and the West Indies, a Goan, Russians, Danes, Canadians and a lone Belgian. 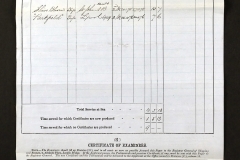 The youngest apart from the apprentices was sixteen year old John Brown of Cheshire. He was on his first voyage and deserted at Melbourne. Had he planned this as a way to get free passage to Australia? Or was life at sea not for him? A group of the other lads had deserted together a few days earlier, why didn’t he go with them? Did he make a life for himself in Australia, or did he eventually join another ship? Oldest man aboard was G.T. Campbell of Dundee. 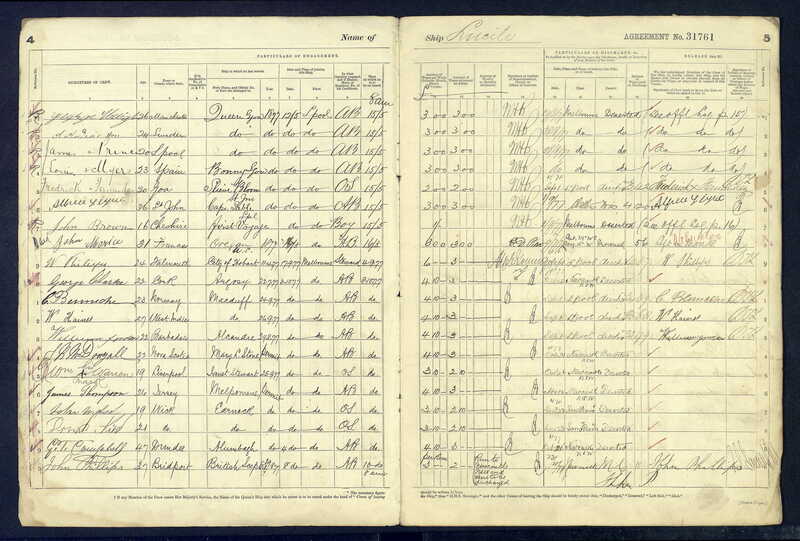 He was one of the original crew who joined at Liverpool, but deserted in Newcastle NSW, her second port of call. What prompted a man surely near to the end of his seafaring days to skip off? Shanghai’d to another ship? Mugged and left for dead in an alley? Joined a gold rush and began a new life as a digger? 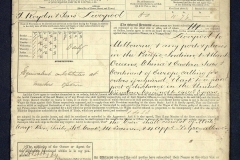 Of the original crew just six, including the two Scott brothers, returned to Liverpool sixteen months later on 1 September 1878. 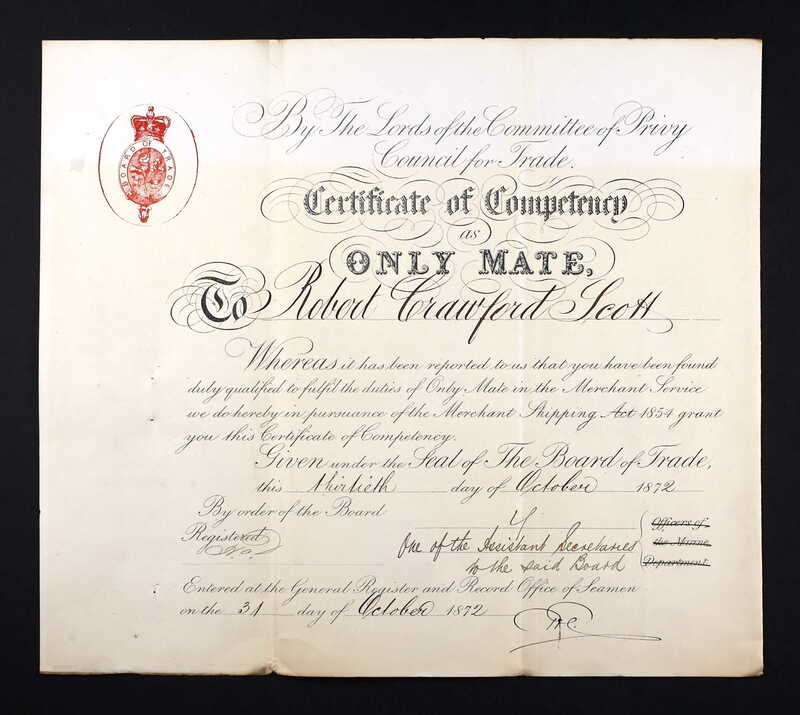 Robert Crawford Scott did not dally in Liverpool, on 25 October 1878 he joined Prince Umberto as Mate. She was registered 1400 tons, and owned by Moran Galloway. 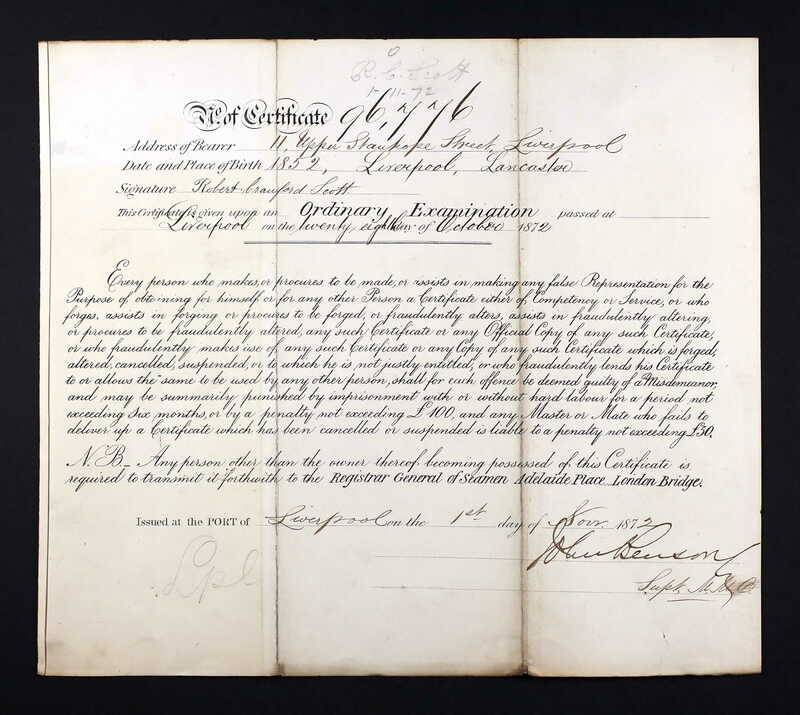 Robert’s younger brother James was aboard, two years into his six year apprenticeship. 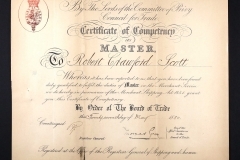 His father (also Robert Crawford Scott) was master. Together they set sail for Peru, and another lucrative cargo of guano – this time without the drama of the disasters which had visited her previous voyage. 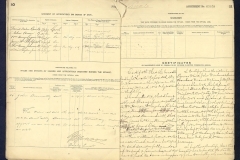 Five months at sea was followed by five weeks ashore, then another 11 months at sea with his father and younger brother. 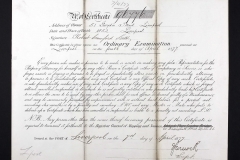 He was discharged at Gravesend 3 April 1880, and took his Ordinary Master’s examination on 13 May 1880 at Liverpool. Again, he failed his first attempt and had to re-take on 19 May. This time it cost him £2! Robert’s movements for the following few years have yet to be traced. 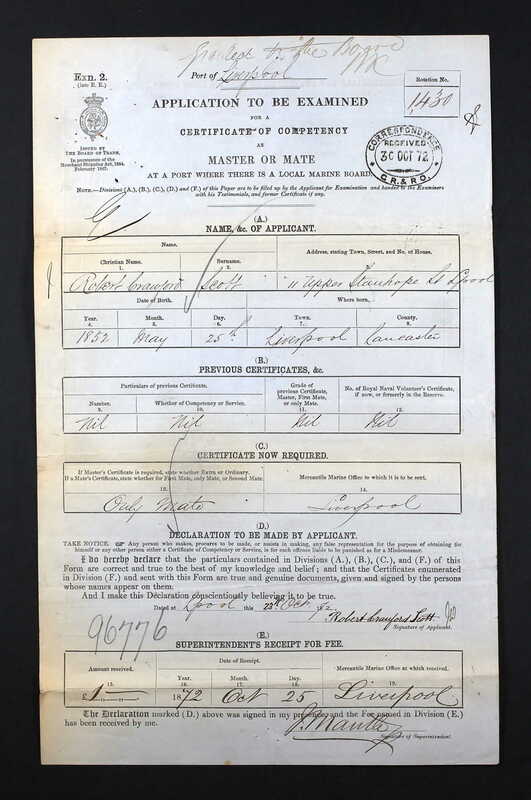 The next document I have found is from seven years after he took his master’s exam – an entry in the marriage register. Robert Crawford Scott, bachelor, aged 35, of 46 Arnold(?) 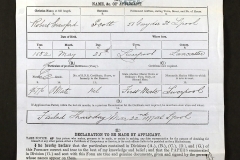 Street married Elizabeth Linaker, spinster, aged 28, of 105 Upper Stanhope Street. Against all odds, this house is one of only two still standing on the street. 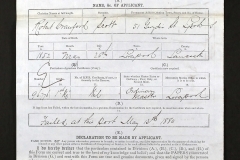 The wedding took place at St James’s Church on 27 September 1887 and was witnessed by Margaret Scott, his sister and James CompletelyIllegibleSignature. 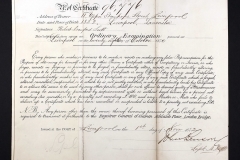 Elizabeth was born in 1859 and baptised at St Thomas’s Toxteth on 27 March. Her father Richard was a sailmaker, and the family lived in 93 Stanhope Street. 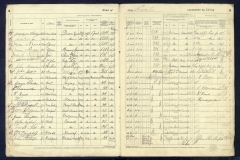 They were still there in 1871 according to census returns, and in 1881 when Elizabeth was 22 she still lived with her family at 78 Stanhope Street. 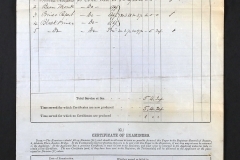 Her mother had died around 1879, and she was living with her father (now a Master sailmaker), her older sister Eliza who had two young daughters, a servant and two boarders – one a sailor and one a veterinary surgeon. 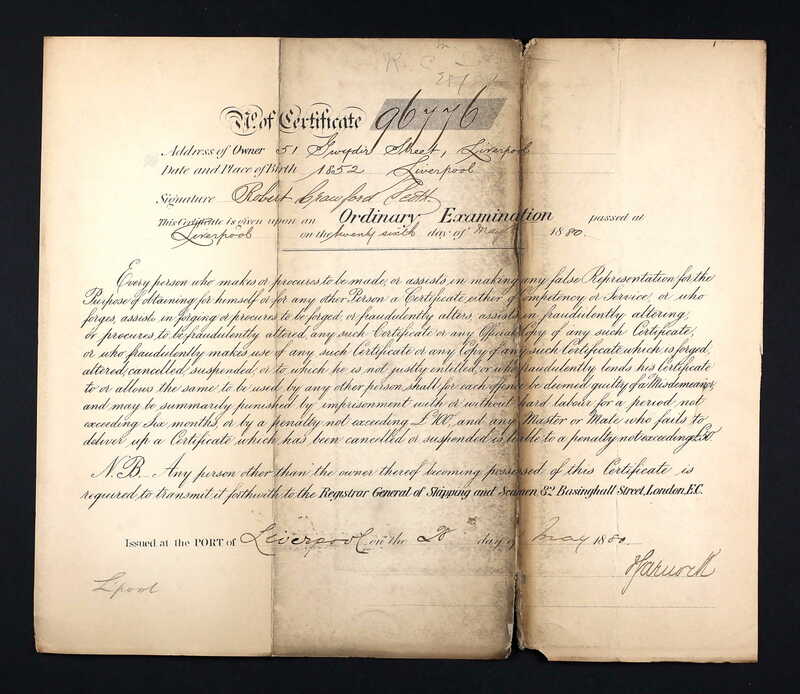 A daughter came along for Robert and Elizabeth within a year – Agnes Dorothy was baptised 22 August 1888 at St James. The young family was still living at 67 Berkley Street when the next child Edith Crawford Scott was born in November 1890. 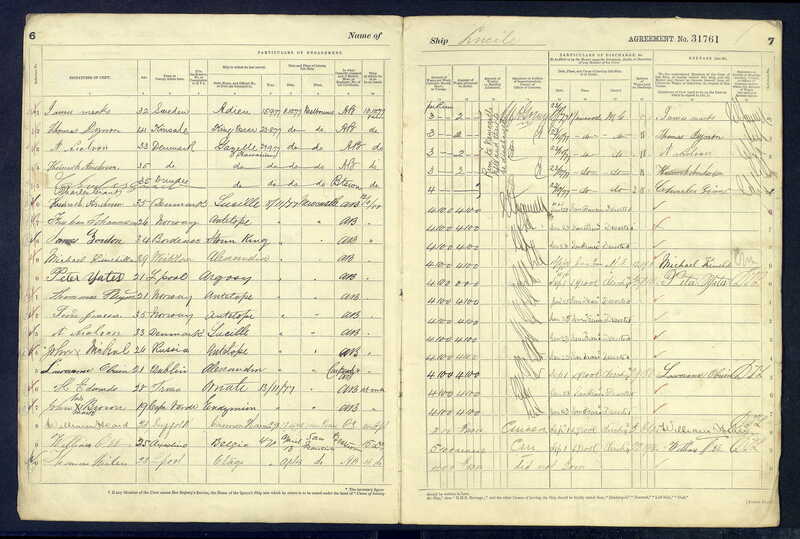 At the 1891 census 67 Berkley Street is shown as three separate households of three rooms each. One household comprises Robert Crawford Scott, his wife Elizabeth and their two daughters. 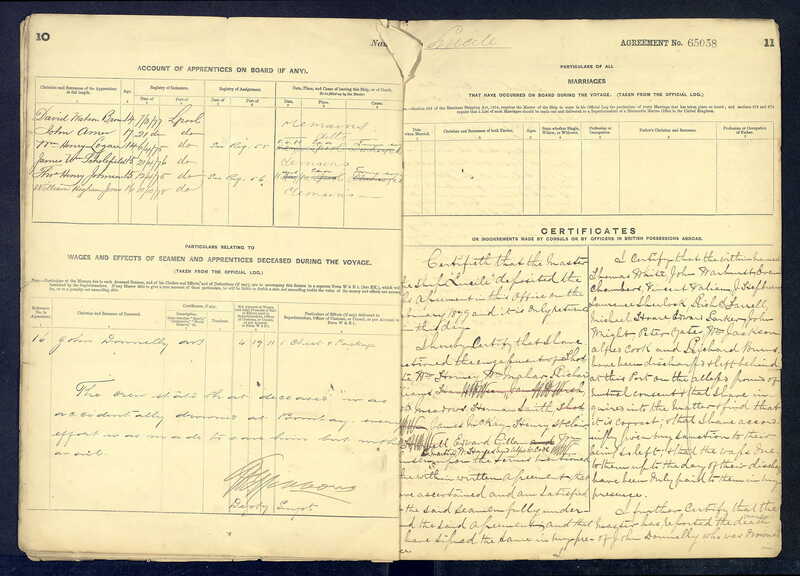 The second is sister Eliza Wyllie (wife of a marine Engineer, not present) and her five children. Third household is Elizabeth’s widowed 68 year old father and his servant girl Harriet. The houses on Berkley street were substantial, as the photo above shows. It was taken in 1962 shortly before the street was demolished – down at heel but their former grandeur still evident. Barque “British Princess” Leith 15th March 1900. 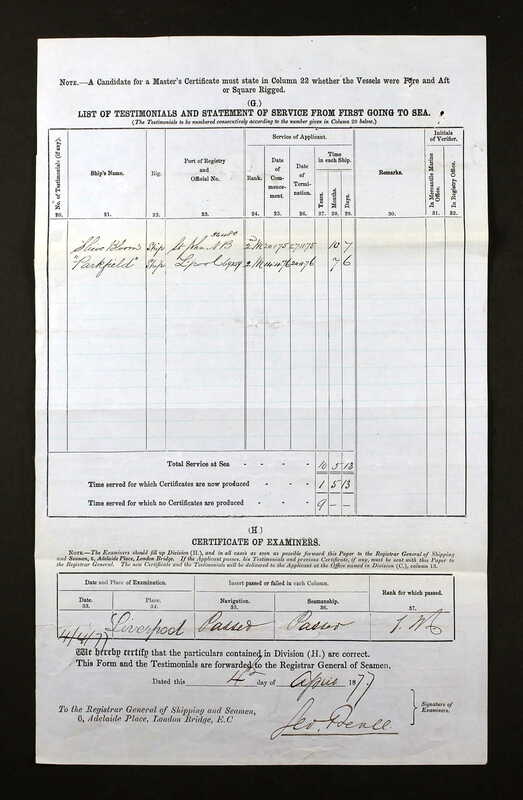 I beg to state that my apprentice and latterly able seaman Mr A. D. Linklater committed a breach of discipline in Melbourne on the 27th July 1898 for which he was logged and fined in court in Melbourne. In view of that I felt I could only give him G for conduct on the discharge. 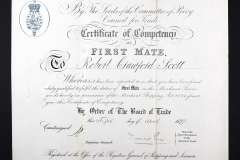 Both before and since the above date he has been a good apprentice and seaman, sober and attentive at all times and it is my desire that he may succeed in life. I will be gratified to learn that the Board of Trade will allow him to come up for a second mates certificate when he is ready. I like to read this as evidence of a man able to see a sailor’s positive traits but mindful of his duty to report accurately on the men in his charge.